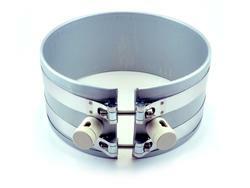 Mica Band Heaters deliver reliable high-temperature heating to cylindrical surfaces. 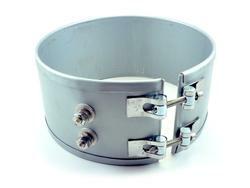 They are available in one-piece or two-piece construction along with a variety of diameters, widths, voltages, and wattages clamp styles and power connections. Common applications include plastic injection molding, plastic extrusion, molding presses, die casting, blown-film, packaging, food processing, analytical instrumentation, and more. BriskHeat Mica Band and Nozzle Heaters are manufactured with only the highest quality materials for superior performance and durability. Choose from over 140 in-stock configurations or tell us what your special requirements are, and we will have it designed and shipped in 2 weeks or less. 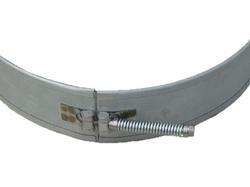 High-temperature electrogalvanized steel sheath provides oxidation resistance and extreme durability. 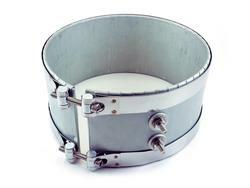 Premium grade mica insulation provides excellent electrical insulation at high temperatures. 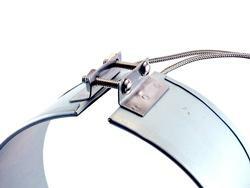 Stainless-Steel barrel clamps maintain clamping pressure at elevated temperatures. 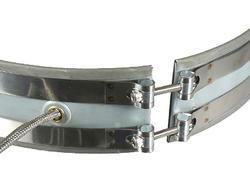 Nickel/Chromium resistance wire is evenly wound for uniform heat distribution and reliable accuracy. Low-Profile designs are approximately 1/8 in (3 mm) thick. 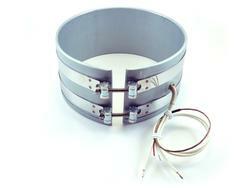 High watt density up to 40 W/in² (6 W/cm²) for high-performance heating in demanding applications. Maximum operating temperature up to 850°F (454°C). Button terminals may be ordered in same position as post terminals. 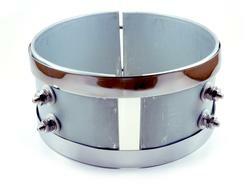 Standard Barrel nuts are 3/8” diameter and use a #10-24 socket head cap screw. 4" long bolt (#10-24 thread) with 2.25" long spring. What is the difference between a Band Heater and a Nozzle Heater? A nozzle heater is a smaller version of a band heater. Typically, a heater with a diameter of 3 in (76 mm) or less is considered a nozzle heater. What is Mica and why is it important? 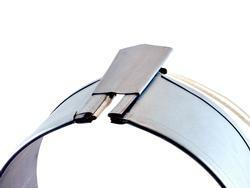 Mica is an electric insulation that surrounds the heating elements in band and nozzle heaters. 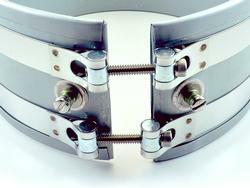 It provides the dialectric strength needed for demanding applications. 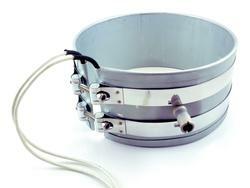 What is the maximum watt density and operating temperature of a BriskHeat band or nozzle heater? Maximum watt density is 40 W/in² (6 W/cm2) and maximum operating temperature is 850°F (454°C). 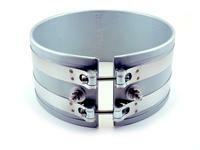 What 3rd-party approvals do BriskHeat band and nozzle heaters have? 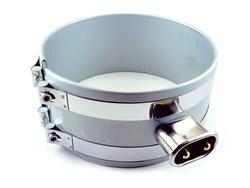 By request, BriskHeat band and nozzle heaters can be manufactured to UL Standard UL499 and CE compliance. What if the cylinder I need to heat has obstructions? 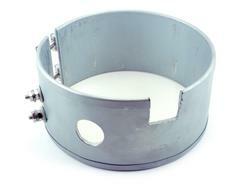 BriskHeat band and nozzle heaters can be made with cut-outs, holes, and slots. 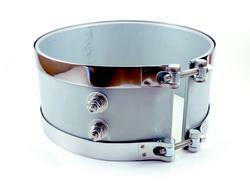 Are all band and nozzle heaters cylindrical-shaped? No. 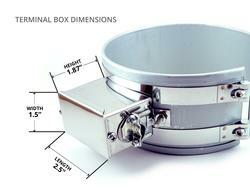 BriskHeat can also supply these heaters in “box” or rectangular shapes. 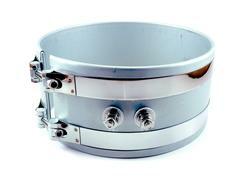 Are BriskHeat band and nozzle heaters approved for hazardous locations?